Lessons and Service-Learning Project Ideas Related to Food Security and Food Justice: This toolkit will guide instruction and provides ideas for service project ideas and community resources. This is designed to spark ideas for learning and actions related to understanding and impacting food justice in an urban community. Note: This toolkit is focused on Detroit/Wayne County but may be easily adapted for other areas. The best service-learning projects are related to classroom instruction, involve student voice and choice, address a researched need, and work with local resources. This toolkit is focused on Detroit/Wayne County but may be adapted for other areas. Food Security/Insecurity Food security is a state when people have physical, social and economic access to sufficient safe and nutritious food that meets their dietary needs and food preferences for an active and healthy life. There can be food insecurity with and without hunger. Food security is often related to food justice. Food Justice Food justice is fair access to fresh/healthy/affordable food and fair wages and treatment of those who harvest, prepare and serve it. See the HANDOUT below for more teacher-focused background information. Create a local resource guide to distribute to school community and nearby neighbors; This Community Mapping Activity could identify the closest healthy food sources, including community gardens. It could also include contact information for organizations that can help those who are food insecure. Start a school garden; share products with school community and/or local food banks. Organizations in Community Resources below can be of help. Perform service hours/volunteer at a local garden, food bank or other organization that assists with food security. Some of these organizations are identified in Community Resources below. Learning to Give lesson plans teach students about philanthropy concepts and skills. Learning to Give lesson plans teach about food security/justice, nutrition, and gardening. Information about and free resources from community and other organizations. Understanding Advocacy and Action: Examples of the power of advocacy and action. Need to identify community assets? Try building a Community Map. Locate local nonprofits via GuideStar.org. Global Health: Hunger and Food Around the Globe, 3 lessons, grades K-2 Children learn about food insecurity and discuss what it feels like to be hungry. They also learn efforts to bring food to people who are hungry. Global Health: Hunger and Food Around the Globe, 3 lessons, grades 3-5 Making healthy and sustainable food choices and learning about food insecurity. Food for Thought: Hunger Around the Block and the World, 4 lessons, grades 9-12 Nutrition, hunger and how to make a difference. KGD's mission is to promote a food sovereign city where the majority of fruits and vegetables Detroiters consume are grown by residents within the city's limits. KGD provides education, equipment and grows transplants for gardens in Detroit, Highland Park and Hamtramck. KGD also operates a small educational farm. 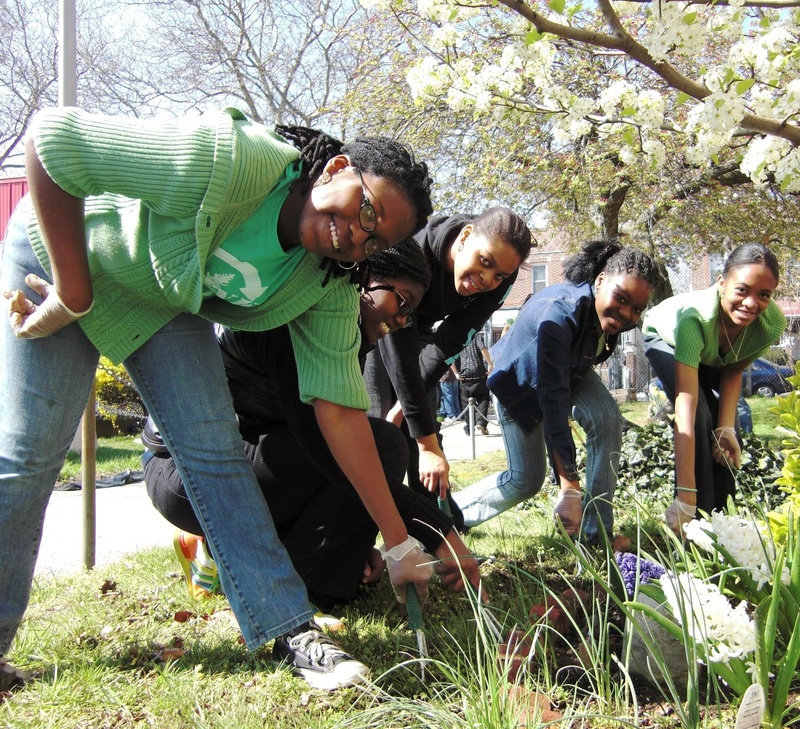 Service learning events and tours are available for students ages 12+. Contact info@keepgrowingdetroit.org (313) 757-2635. MSU Extension offers Community Food Systems educational programs. For teachers and schools, they include workshops about starting a school garden, site visits and evaluations to support such gardens and teacher professional development. To schedule a workshop or for more information, contact Kristine Hahn, Community Food Systems Educator at (248) 802-4590 or hahnk@anr.msu.edu. Gleaners Community Food Bank is a vital link between available food and those who need it most. It operates centers in Wayne, Oakland, Macomb, Livingston, and Monroe counties and provides food to 499 partner agencies, including many local schools. Its “Kids Helping Kids” service-learning program for youth includes a food bank tour, nutrition education, and a volunteer project that will help their hungry peers such as packing food bags for distribution at schools, gardening through their Food Zoo, and creating clay bowls through the Empty Bowls program. For more information, go to http://www.gcfb.org/khk. To request a speaker from the Gleaners Speakers Bureau, contact Julie Ptasznik at jptasznik@gcfb.org. This 24-minute video about the Campaign for “Justice, Dignity and Sustainability” Describes deplorable living conditions of farmworkers [some liken to “slavery”] and the successful campaign to raise wages of tomato workers by targeting fast food and upscale networks; young people are prominently featured. Here is further information about working conditions for farmworkers and how immigration and labor issues impact these workers. Groups like the Coalition of Immokalee Workers, the United Farm Workers and Farmworker Justice are farmworker advocates. Detroit Food Academy engages students while they are still in school, emphasizes youth leadership, and surrounds them with supportive networks to ensure lasting success. Its place-based focus on social entrepreneurship contextualizes learning with real-world relevance. After-school Leadership Program: A school-year leadership development program for young Detroiters that culminates in the design and launch of students’ own triple-bottom-line (people, planet, profit) food business. Contact Program Director, Yolanda Scarborough at Yolanda@detroitfoodacademy.com. Food Span is a free, downloadable high school curriculum [3 units/17 total lessons] from Johns Hopkins university that highlights critical issues in the food system (farm to table) and empowers students via a “food citizen” action project. It is aligned to national education standards in science, social studies, health, and family and consumer sciences. The lesson plans include learning objectives, essential questions, time required, handouts, slides, supplies required, and a glossary. Big Green offers links to guides, videos and classroom activities on managing a garden including planting, watering, harvesting and other topics. The Teen Food Literacy Curriculum provides detailed discussion guides and instructions for facilitating a 13-session course to teach leadership skills to teens through the lens of food literacy and advocacy.